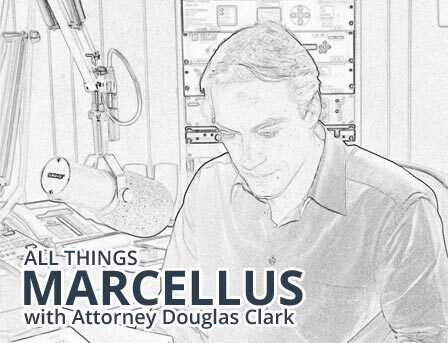 All Things Marcellus is Attorney Doug Clark’s weekly radio show designed to educate and to provide high quality information to Pennsylvania Landowners on all natural gas development issues. All Things Marcellus is an outstanding resource for all Landowners, especially Landowners directly involved in oil and gas development. Doug announces landowner ONLY seminar for Wednesday, June 15, 2016 at the Dean Center in Wellsboro, Tioga County. Landowners must pre-register and non-registered landowners will not be admitted. Doug discusses his statewide representation of Pennsylvania oil and natural gas rights’ owners and the various oil and gas attorney services provided by The Clark Law Firm, PC. Doug explains his oil and gas practice across Pennsylvania and landowner only representation. Doug introduces listeners to Pennsylvania’s Oil and Gas Conservation Law and its applicability to the Utica Shale formation. Doug jumps on his soap box to beg landowners to “STOP SIGNING” oil and natural gas agreements without knowledgeable and experienced legal counsel. Doug again reminds listeners that when gas companies stop drilling expensive horizontal wells in a low natural gas price market opportunities may arise to negotiate new leases or to negotiate landowner friendly addendum terms when extending or modifying your oil and gas lease. Doug dedicates this All Things Marcellus show to identifying oil and natural gas right owner “opportunities” when they are approached for new agreements, including but not limited to gas lease extensions and modifications, extensions of pipeline agreements, and all other natural gas related agreement extensions. Doug walks listeners through a sample consultation and review with a landowner with a pending request by the gas company to extend their expiring oil and gas lease. Doug introduces how the landowner contacted the office to begin the consultation and review process and what actually goes into the initial review and consultation when landowners send in their oil and gas lease and related documents to the office for a detailed in-office or telephone conference call. Doug discusses oil and gas lease termination language and when do gas leases terminate. What is “held by production” and how can I tell if my gas lease has ended? Doug discusses what energy companies and drilling companies have to do to continue a gas lease beyond the primary term. Can a natural gas company park a truck on my property or must they drill and pay me royalties to extend my lease, or is the answer somewhere in the middle. Doug breaks down a typical 5 year gas lease and when a lease will terminate or continue beyond 5 years. Doug also begins the Pugh Clause discussion and how non-unitized acreage can be released under certain circumstances. Learning from mistakes. What factors should landowners be considering in order to avoid entering into bad agreements with energy companies. Explanation of the impact of low natural gas prices on Pennsylvania landowner’s royalty payments. Doug discusses his oil and gas websites and natural gas blogs for landowner information. Why oil and gas right owners must consider low gas prices when evaluating any outstanding gas lease offers, gas lease extension offer or any other natural gas contract. Does it make sense to enter into contracts with gas or pipeline companies when the companies tell the landowners that they do not have money and they are not drilling at this time? Doug addresses the importance of specific legal counsel and advice for each landowner’s individual situation. If you are presented with an offer to extend or modify an existing oil and gas lease, you must fully review your options and not extend terrible agreements for many years or decades into the future. Landowners must stop signing bad legal contracts and must start seizing and maximizing opportunities and second chances. Doug explains how The Clark Law Firm, PC represents landowners and oil and gas right owners across Pennsylvania and clients across the country. Doug addresses why he has been hired by gas and pipeline company employees and Landman to represent them on their own personal property and gas right ownership. Why do company representatives and employees hire knowledgeable oil and gas attorney’s to represent them in private affairs? Landowners must recognize that the gas company Landman is out to negotiate the best possible deal in favor of the company they work for, and not you, the landowner. No gas company or pipeline company Landman goes to the landowner’s house and tells them that they are working for the company and they are out to get the best deal for the company and give the landowner the worst terms possible. Even company representatives and Landman know the benefits and will often hire attorney’s to work for them in their own private matters involving gas and pipeline companies. Doug continues to discuss why landowners should avoid the “signor” tag by the company. Doug explains the importance of not simply signing the first set of documents offered by the company landman. How negotiation and information will lead to property owners signing the best possible gas lease, pipeline easement and other agreements that will impact future generations. Doug continues to introduce himself to the new southwestern Pennsylvania audience, including Greene County, Washington County, Armstrong County, Westmoreland County, Allegheny County and beyond. Doug explains how All Things Marcellus is deigned to educate and inform Pennsylvania oil and natural gas right holders and to provide quality information they need to understand oil and gas development in Pennsylvania. Doug discusses the importance of landowner specific information and leverage assessment in oil and gas company negotiations. Discussion regarding company Landman tactics and approaches to landowners. What landowners should be watching out for and thinking about when dealing with gas and pipeline companies. Doug discusses expanding All Things Marcellus to southwestern Pennsylvania in such areas as Greene County, Washington County and beyond and the need for quality information to assist landowners in making the best decisions for their property. A quick summary of oil and gas prices and why companies are cutting production volumes of natural gas and seeking to delay drilling shale gas wells in Pennsylvania. Doug announces that All Things Marcellus may be expanding to southwestern Pennsylvania and the Pittsburgh market in weeks to come. Doug sets the stage for the discussion of the impact of low natural gas prices on company activity and development and offers to landowners for gas leases and pipeline agreements. Doug introduces the importance of understanding each individual circumstances and evaluating the impact of natural gas prices and energy company stock prices on landowner agreements. Doug welcomes KC101 in Tioga County as a new station hat is now broadcasting All Things Marcellus every Saturday and Sunday from 9-10AM. Doug discusses the spirit and intent of the radio show as and begins addressing interesting amendment of oil and gas lease agreements and the trend for more and more amendments, modifications, and extensions of gas and pipeline agreements due to low natural gas prices. Doug explains the impact of the natural gas market on drilling activity and what companies do to hold or extend leases in order to buy time to conduct drilling operations. Doug discusses the economics of supply and demand of natural gas and the impact in oil and gas drilling operations. Doug discusses oil and gas landowner and royalty owner representation. Doug does not and will not represent an oil and gas company or pipeline company. Doug discusses termination provisions in oil and gas leases. Doug explains Held by Production and how companies can manipulate the term length of oil and gas leases by spreading production over many decades. Discussion regarding a second bite of the apple with oil and gas lease and natural gas pipeline agreements extensions and modifications. Landowners must take advantage of rare second opportunities when presented. An extension or modification of an existing agreement may present landowners the ability to increase compensation and reach better written agreements with energy companies. Doug discusses natural gas pipeline representation and the difference between FERC – Federal Energy Regulatory Commission Pipeline projects and natural gas gathering projects. The key to understanding pipeline projects and whether eminent domain and condemnation are a factor and the value to understand landowner’s options and rights when presented with Right-of-Way and easement agreements. It is never too late to contact and oil and gas attorney to evaluate your rights and formulate a strategy when presented with any energy company contract. Doug discusses well pad and well site agreements as surface use agreements which supersede the terms of an oil and gas lease. Doug explains the need for liability protection and indemnification language in future contracts and surface use agreements. Doug offers examples of how landowners can be sued and lose indemnification and hold harmless protection by failing to put necessary language in the future surface use agreement. Doug explains how signing bad natural gas and pipeline agreements are not a problem until they become a problem. Discussion regarding how company friendly contracts can come back to bite the landowner in the future. Doug emphasizes the importance of experience in oil and gas issues. Also, discusses estate planning issues and the importance of having a specific plan in place to benefit your beneficiaries and heirs. Doug discusses gas and pipeline company’s landmen’s pitch of a “partnership” to landowners. Doug provides an example of landowners who signed documents upon company representations only to be extremely disappointed when their property is turned into an industrial zone. Doug touches on natural gas royalty deductions and percentage of deconditions relative to royalty payments; the need to have individual representation for estate planning. Why every landowner should have at least a review and consultation with Attorney Clark before entering into any agreements to sell any oil, gas or mineral rights to any third party. Doug discusses solely landowner legal representation. Gas lease amendments to modify existing leases and need to understand and negotiate to avoid common mistakes. The impact of low natural gas prices on lease and pipeline offers and the potential of future gas price increases. The need for landowner representation. Doug goes off. Doug rants about Pennsylvania Landowners being taken advantage of by gas and pipeline company landmen and not appreciating the adversarial nature of the process. Doug reviews how landowners were taken advantage of during the gas leasing phase and are repeating the same landowner mistakes when dealing with pipeline, roadway, and related issues. Doug implores landowners to recognize their unique situation and negotiate all contracts and agreements. Doug promotes Wednesday, October 21, 2015 seminar from 6pm to 8pm at the Deane Center in Wellsboro. As well as Doug’s appearance on Tioga County Today hosted by Mike Neff. Doug discusses the importance of understanding your oil and gas lease and identifying what rights you are granting the gas company in exchange for the bonus payment and promise of potential future royalties. Doug addresses the importance of identifying the rights you are granting the company and the need to restrict those rights or identify the rights given to the company that you cannot restrict. Even though we had never met, when we called and spoke to you on the phone we felt confident that you would work on our behalf. After speaking to Marceea and later to Doug, we knew that you were the right people to do the job for us. We appreciated your patience in working with our family, which I know was a little complicated. All of our questions were answered and our many concerns were carefully explained. You can be sure that we will call on you again for future legal work. Speaking to you and working with you was like dealing with old friends. I am so glad we chose your firm to work on this lease, and we all want to thank you again.